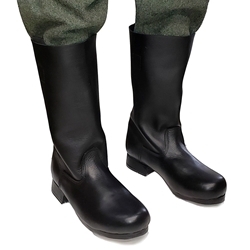 Our German M39 Jackboots Reproductions are High quality newly made replicas of the Enlisted Man's World War Two German Jack Boots. These Jackboots are made from Full-grain leather uppers, leather soles, hobnails and heel irons and are dyed black. The Germans called this boot Marschstiefel, or Marching Boot. This is the classic boot used by the German Infantry and Stormtroopers in World War II. Medium width, for half sizes order next size larger (if you wear a 9 1/2 order size 10).